Villa in Felanitx with pool, barbecue, 3 bedrooms, 3 bathrooms and wifi. Property 4: Villa in Felanitx with pool, barbecue, 3 bedrooms, 3 bathrooms and wifi. Sa Portassa - House for 4 people near the sea. Property 6: Sa Portassa - House for 4 people near the sea. Property 9: Village house, recently renovated. Property 10: Dream view, relaxing holiday with pool, in the comfortable apartment * Cala Brafi "
Apartment with an upper terrace and beautiful views of the harbor. 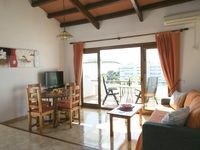 Property 16: Apartment with an upper terrace and beautiful views of the harbor. CAN PALLETA (SON PROHENS) - Villa for 5 people in Son Prohens. Property 20: CAN PALLETA (SON PROHENS) - Villa for 5 people in Son Prohens. ideal for holidays with family or friends, near Cas Concos Finca. Property 36: ideal for holidays with family or friends, near Cas Concos Finca. 'Maria', waterfront apartment with pool, next to beach, WIFI, stunning views. Property 45: 'Maria', waterfront apartment with pool, next to beach, WIFI, stunning views. Great spot, away from the crowds and plenty of space! Very spacious apartment with plenty of room for our family of three. Kitchen is fully stocked with everything you need. Only downside was there were mosquitoes during our stay but we loaded up on repellent and were fine after that! Recommend for a calm relaxing getaway! A wonderful stay in Mallorca! My husband and I had the pleasure of staying in this beautiful one bedroom penthouse last week. We really enjoyed the balcony, sun deck and spacious living areas. We LOVED the view of Cala Ferrera! We also enjoyed the easy walks to restaurants and more serene Cala Serena. Thank you Mercedes for meeting us at the penthouse to ensure our access to the property and for all the info on the area from a &quot;local&quot;. We would love to come back someday and spend a month.